Artist Manuel Reyes aspires to exhibit his work in art galleries in Oaxaca and Mexico City. Give him that exposure over the next couple of years, and there’s little doubt his genius will be known in New York, Chicago, and further abroad. American, Canadian and European art collectors are already tapping their Mexican networks to figure out how to make their way to his modest home and workshop in the village of Yanhuitlan, an hour and a half outside of the city of Oaxaca, to marvel at his artistry … and buy it up. While Reyes obtains his clays from many different areas, most are from four main locales: a riverbed about a kilometer from his home, upstate at Huajuapan de León, the town of Santa María Cuquila, and from Zacatecas, northwest of the nation’s capital. Each compound has different qualities. His Zacatecan clay is strong and has a sandy texture, making it suitable for sculpting his large, almost life-size human figures; more utilitarian pieces such as plates and cups are made with earth from Cuquila; pieces which he intends to burnish are sculpted from clay from Huajuapan de León; and he mixes local soil with the Zacatecan earth to yield a more malleable and easily workable clay. For colors, Reyes often looks to other parts of the nation so as to enable him to obtain the variety he needs. “That painting hanging in our kitchen provides a good example of the range of colors I derive from combining different earths. Many of my paints come from the environment. 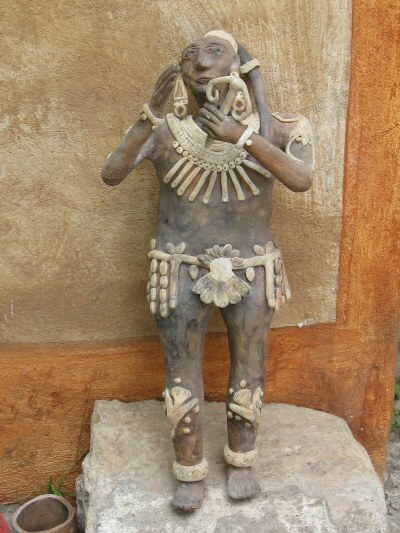 I brought a kilo of clay from Chihuahua and used it to make paint for that male figure looking skyward. That white is an oxide.” Indeed the breadth of colors he is able to create for use on both his sculptures and his paintings is remarkable. Manuel’s canvases are generally “mixed technique” as he refers to them, a combination of oil, acrylic and natural earth. Depending on the inspiration for a particular work, and the imagery he seeks to convey, the order and manner of application and the texture and origin of the soil applied, will vary. Reyes readily acknowledges that this is still a business, his livelihood, and when gay male collectors began taking an interest in this phase of his artistic development, it motivated him to continue with it and further experiment with the theme of male sexuality as depicted in the codices and sculptures of earlier civilizations. But Manuel’s work also reflects his personal interests and passions, his reverence for Oaxaca’s present day rich cultural traditions, and his eclecticism whereby he’s prepared to push the outer boundary of what’s traditionally considered art, at times combining aestheticism with pure functionality: “I know a really good carpenter here in Yanhuitlan, and thought of combining our two trades, sort of as a fun project. I asked him to make me a cabinet with shelves and doors. I painted it and then put six mask tiles, each with a fair bit of relief, on the door panels. It came out really funky and a collector bought it within a couple of weeks of when I’d finished it. Reyes has begun experimenting with masks as an art form. Their use at fiestas and for parades is common practice in Oaxaca, the tradition dating back perhaps 3,000 years, when permanent settlements were first established in the region. He pays tribute to the ritualistic use of masks with one of his sculptures, a marcher holding a mask in front of his face, still a common sight at Oaxacan celebrations today. On a recent visit to Reyes’ home, the music of Lou Reed was playing. Rock, blues and other genres of the 60’s and 70’s are included in this extraordinary man’s list of delights. And of course, they are reflected in his work. He’s created clay painted figures of John Lennon, Jimi Hendrix and Jim Morrison, simply as a way of paying homage to some of his rock idols. Led Zeppelin’s Stairway to Heaven was the inspiration for one of his more “traditional” sculptures, with four men each climbing up a rung of a ladder made of reinforced steel covered with twine, each step framed by horn-shaped clouds. More recently Reyes has become interested in depicting vestiges of the material culture of his indigenous forebears, combining his gift as a skilled artist with the work of an applied archaeologist. For example he recently found a potsherd with a painted design, and through extrapolation has created an entire, accurately crafted three-footed vessel. Through his art, Manuel Reyes is continually looking for new modes of self-expression, while at the same time reflecting on diverse cultures, both present-day and of the near and distant past. He’s a true renaissance man whose golden touch will undoubtedly, over time, become appreciated by an increased following. The exhibitions of his work in Huajuapan de León and at the Museo del Arte Popular in San Bartolo Coyotepec where one piece remains on permanent display, pale compared to what’s in store for Manuel … and art aficionados around the globe. Alvin Starkman received his Masters in Social Anthropology in 1978. After teaching for a few years he attended Osgoode Hall Law School, thereafter embarking upon a successful career as a litigator until 2004. Alvin, while still a good-standing member of the Law Society of Upper Canada, now resides with his wife Arlene in Oaxaca, where he writes, leads small group tours to the villages, markets, ruins and other sights, is a consultant to documentary film companies, and operates Casa Machaya Oaxaca Bed & Breakfast, providing the comfort and service of lodging in a Oaxaca hotel, with the personal touch of a quaint country inn.